I met Jennifer and Ryan through Veronica with Mile High Celebrations (an AMAZING Colorado wedding planner), and I couldn’t be happier to have met this amazing couple. Back in December 2015, I traveled out to Omaha to photograph their engagement session (you can check out their Festival of Lights engagement here). I knew after witnessing their amazing chemistry together in sub-zero weather for the evening that they’d have a beautiful wedding. That statement couldn’t be more true. 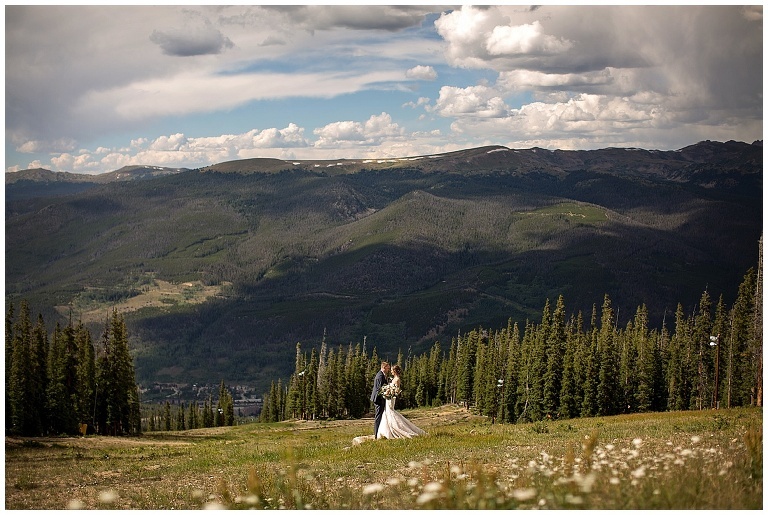 On August 13, 2016 – Jennifer and Ryan were wed on the top of Keystone Resort at the Schoolmarm run facing Lake Dillon. To start their afternoon off, we headed into River Run Village to have their first look. Of all the first looks I’ve photographed, Ryan surely had one of the most genuinely excited and loving reactions I’ve witnessed. To sum up these two in one word, they are certainly Smitten. Jennifer and Ryan wanted to make sure that we had a nice, relaxed timeline for the day. One thing that I always recommend is to allow for some down time for the bride and groom, a chance to spend just a few minutes to yourselves. After a relaxing Gondola ride up to the ceremony spot, their closest 30 family members and friends joined them on top of the Mountain for their intimate ceremony. I can specifically remember Jennifer whispering mid-ceremony to Ryan, “I’m so happy”. This perfectly describes the feeling that everyone could feel during their vows, pure happiness. To enjoy the rest of their evening, we headed up a secondary Gondola to the AlpenGlow Stube for their reception. Just before we headed in for the evening, we found the most magically lit spot in the forest to sneak in a few last portraits of Jen and Ryan. I think my secondary photographer and myself about had a heart attack when we saw the backs of our cameras. Thank you again, for inviting us to be a part of your incredibly stunning day Jennifer and Ryan – it was an honor to spend the day up on the mountain with you. This is a beautiful wedding! You captured their day beautifully. I just love your editing style! First off, I love that you took a pic of the dress outside. So unique. I also love the outdoor shots but the reception b&w one with the light casting a beautiful shadow on them during the reeeption. Great job! Holy cow! These are gorgeous! I love the landscape, her dress, the details, his reaction to the first look…wow! Fantastic work! "Savannah is the most AMAZING photographer!!! I would recommend her a thousand times over again. I would plan another event just to use her again! She is incredibly professional and incredibly talented!!! Best vendor/photographer/professional I have ever worked with." "Savannah is an amazing person and photographer! She captured our wedding in every way we could imagaine. Looking back on the pictures she took makes us remember and feel those special moments. Savannah is very professional but at the same time will help load up carseats and offer a helping hand wherever she can. She is very knowledgeable from locations to take pictures to making us feel comfortable in directions to pose. We have nothing but good things to say. We definitely reccomend Savannah Chandler!" Click HERE to see Ashley and Aaron's Estes Park, Colorado Wedding Day! Savannah was so great and managed to make us (two awkward people) feel super comfortable and thrilled about wedding photos. :) She saved our day with her flexibility and the pictures were better than we could've ever hoped for! Highly recommend! © 2019 Colorado Mountain Wedding Photographer|P6 Photo Blog|Design by Northfolk & Co.